For many people, the aim of a trip to Tanzania or Kenya is to see the “Great Migration”. The migration is not a once-off event, it’s a continuous annual process – the explanation below shows where the main herds generally should be at any particular time, but often they are NOT – as with the early season a few years ago , where the big herds were all around the centre of the park in JAN / FEB, and then in the South in APRIL / MAY. They also move backwards and forwards, and across the park, sometimes over 40 km overnight! It is also NOT one huge herd of animals, but numerous large and small herds, all with their own particular agenda. June/July – game moving northwards within the Serengeti, through the ‘western corridor’ as well as up into the Lobo areas of Serengeti. Crossing the Grumeti river –lots of crocs! July/Aug – crossing over the Mara River into neighbouring Kenya. Note that a good portion of game remains in the Serengeti year round. Aug / Oct – generally good herds up in the Mara, high season up there – busy !! Nov / Dec – game starting to move southwards back into the Serengeti, through the central region (Seronera), to commence the whole process again. Remember – there is excellent game viewing in Both Kenya and Tanzania All Year Round – but, the migration patterns are roughly as above. Rainfall – the time of the rains, and also the duration and intensity of the showers has an effect on the grazing and water quality. Water sources and quality – basically, many of the streams and rivers that cross the Serengeti have a high chloride and fluoride content. The water smells and animals do not like drinking it – a good quantity of rain will flush out a lot of salts, leaving pools of decent water… low quantity of rain will not. Controlled burning by National Parks and (uncontrolled) by poachers on the edge of the parks – often drives herds away, until the new grass comes back – which can often only take a week or two. Which is why you can sometimes be in the “right” place (according to some map), at the “right” time, with great fresh grazing, lots of water etc and the migration is NOT THERE!!!! Another point is River Crossings – the famous “huge crocodile catches baby zebra” photo we all want. Apart from the fact that professionals spend months at a time in the park obtaining the right image, you have to have patience. Often you can sit at a great spot, with a large mass of wildebeest on one bank waiting to cross, and they do nothing for 2 days …and as soon as you wake up late, or leave your spot for an hour, you return to the spot and THEY HAVE ALL CROSSED in 20 minutes and are standing on the opposite bank, with only a few fat crocs to show where they were!!!! (We once saw a whole wildebeest completely eaten in 4 minutes by 11 crocs on the Grumeti River). 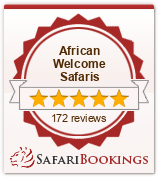 Firstly we try our best to book your camp / lodge in the best area – in our opinion, based on our years of personal experience , plus that of our guides, some of whom have been guiding in the Serengeti for 20 years. We also try to take into account that certain areas / game drive areas of the park do get busy…. and try to avoid these if we can. We then have a good think about the OTHER things that you may want to see while there – lions / cheetah / leopard etc – and the proximity to the area we choose in relation to good areas for these (sometimes this means staying in different areas of the park). For example we may often decide to spend three nights in the centre of the park, knowing that we can almost always get great game nearby, and knowing we’ll be doing a full day out in other areas should the big herds be there. We then design your trip for you, and keep a close eye on the game movements prior to your arrival, so we KNOW where the herds are say a week before you arrive, so we can plan your daily activities. Then, it’s up to you and the guide to have a good time and see as much as you can, whilst still enjoying the sunsets, birds, trees, rivers, resident game and all the other amazing things that make up the Serengeti. This we normally do on a three day stay, by having some “half day” drives, returning to camp for lunch and a siesta, setting off again in the afternoon, and at least one full day “out”, looking for the migration and seeing some more of the park (with a packed lunch / coolbox / drinks etc). Our guides are happy to put in the time and distance for you, and have no restrictions on this, as some other companies have. Of course, the guide will know where to go – from his experience, other guides, charter pilots etc, not just the map. Just note that in some areas there are no roads, so there is no access. Sometimes, you have to drive 60 km from your base to be in the “right” place – sometimes more – but we DO THIS, because we want to do our best to show you this amazing spectacle. But this does not mean that this Migration is the sole purpose – we want to try to show you the variety of other things too, and to stop and watch a baby giraffe or a good sunset, listen to birdsong and appreciate this paradise. It is also interesting to meet some of the local tribes who live in and round this ecosystem and see how they live. We try to think back to our days as “tourists” and how we saved and planned for years to see these sights, and put ourselves in your shoes. with our expectations. We are committed to not run trips like these, and to provide quality time IN the parks for our guests (watch out for this – budget operators often call an afternoon and following morning in a park two days!). football in the canteen until your next mini game drive at 1600!). We, on the other hand, do our best to show you as much as we can, in an eco-friendly, fun and informative way. Which is why many of our guests have been travelling with us for years, coming back at different times of the year and to different areas, because they know that we try hard for them, and get as much fun out of taking them into the bush as they do going there!! Hoping to see you “in the bush” on one of our trips soon.